I have to admit I did not know if I would like Black Panther. This charter is new to me. I of course had seen him a few times but really did not understand his origins. I loved that this movie went into the history. We get to find out how the Black Panther came to be and why. This is a must for me to love a character. The movie was action packed and fantastic. I am so excited that I now have this one in my collection. Black Panther was an action-packed movie from beginning to end. It really told the story and keep me sucked in to what would happen next. To celebrate the in-home release of Marvel Studios’ Black Panther, we’ve uncovered 10 stellar secrets from the making of the epic super hero saga. 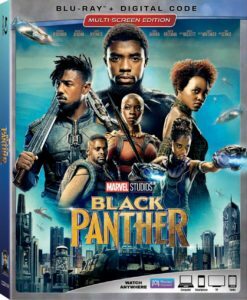 The mighty new Marvel movie is released Digitally in HD, 4K Ultra HD™ and Movies Anywhere on May 8 and on 4K Ultra HD™, Blu-ray™, DVD and On-Demand onMay 15. Wakanda forever! We got this movie in exchange for an honest review all opinions are my own.